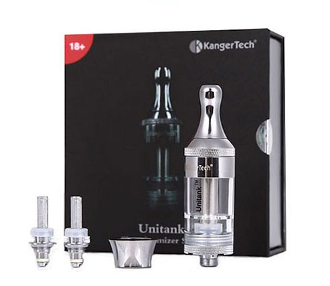 The Kanger Unitank is a top notch clearomizer with a lot of great features. It is a bottom coil tank that is filled from the top. This is an awesome feature (similar to the ViVi Nova) that allows you to fill/refill your clearomizer without having to remove it from the battery. The tank is made up of two chambers. When the top cap is removed, the spring pops up and the airflow and liquid is blocked from the bottom chamber. This prevents leaking during refills. This clearomizer is also glue-free. This means that it can be completely disassembled for cleaning or replacement of parts. It is rebuildable which means the coils/wicks can be removed and replaced. The unitank replacement coils are compatible with the coils/wicks for the Protank 2 and 3, as well as, the EVOD. It is also 510 threaded and will work with your eGo batteries. Remove the center tube and the spring from the old coil, unthread the old coil from the base cap. NOTE:We recommend letting the liquid pass below the seal before refilling. This will help avoid any flooding or gurgling.